It’s pretty clear that there is always room for more on the snack shelf, despite the overcrowding. The trick, of course, is to make your product stand out amongst the bags of chips, pretzels and popcorn. One way to get noticed is to add something unique to your snack of choice. Like beef. Cherkees Beef Jerky Potato Chips are a blend of potato chips and good old-fashioned beef–not beef-flavor, beef as in beef-beef. They come in recognizable flavors like Cracked Pepper, Teriyaki and Smokehouse, which begs the question: what the heck to eat them with? 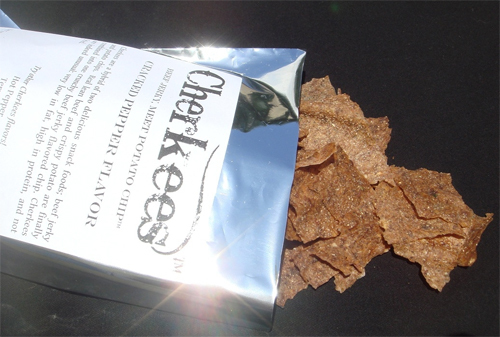 Cherkees are a hybrid of two delicious snack foods; beef jerky and potato chips. These are NOT beef jerky flavored potato chips. Cherkees are beef jerky and potato chips at the same time! Real lean beef and crispy potato finally meet. Cherkees are indeed unusual: very low in fat, high in protein, not fried. Ingredients include; potato, beef, onion, soy, spices. Package size: 5.8 oz.